It’s been a long and busy summer and my blog has suffered. I’ve neglected amateur radio quite a bit due to a heavy work schedule. With the onset of Indiana winter and the first snow on the ground I may be able to carve out a little more shack time now. I’ll try to do a quick recap of the last five month and hit any ham radio highlights. We were sorely in need of some better antennas and feedline at the WD9BSA shack. We were able to trade off some excess equipment for a 500 foot spool of LMR-400 feedline. This allowed us to make brand new runs out to the antennas. We now have two multi-band antennas in the air and ready to go whenever the Scout radio station is activated and on the air. Unfortunately, I missed Field Day this year because of work. 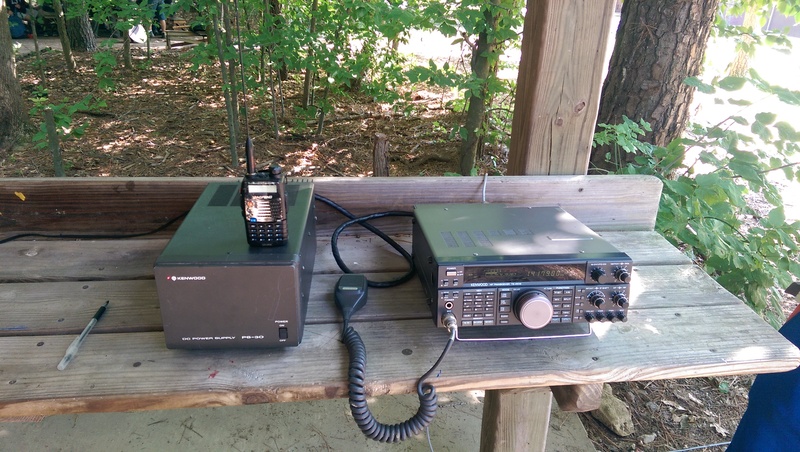 I was able to operated portable Field Day style at Ransburg Scout Reservation. 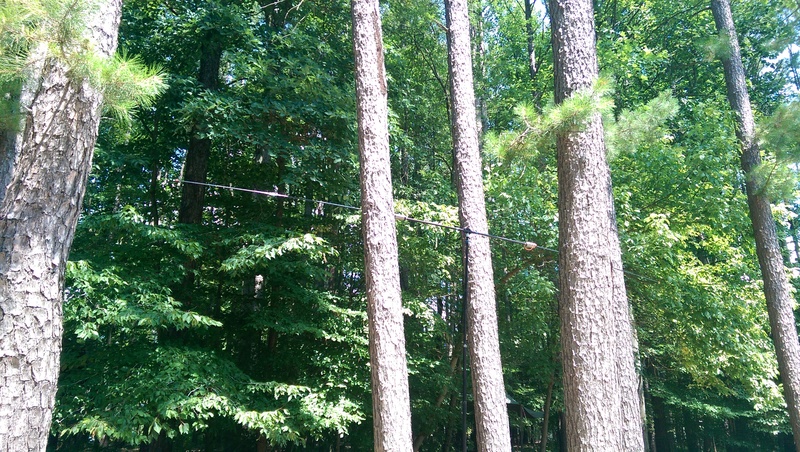 After a more than twenty year absence from Boy Scout camp, I returned with my oldest son, Jared, for a week in July. I had a portable station setup in the STEM area and managed several contacts. The station included a Buddipole antenna and an older Kenwood TS-450SAT with matching power supply. Some contacts of interest were: W100AW ARRL Centennial station, W9ZL special event station at EAA Airventure, and DX station CO6LC in Cuba. Our troop’s Senior Patrol Leader earned his ham license so we were able to communicate throughout camp with HT’s. I have numerous old boatanchor radios in the shop. They’re in various stages of disrepair, unfortunately. I was, however, able to get two of them fired up using a variac. 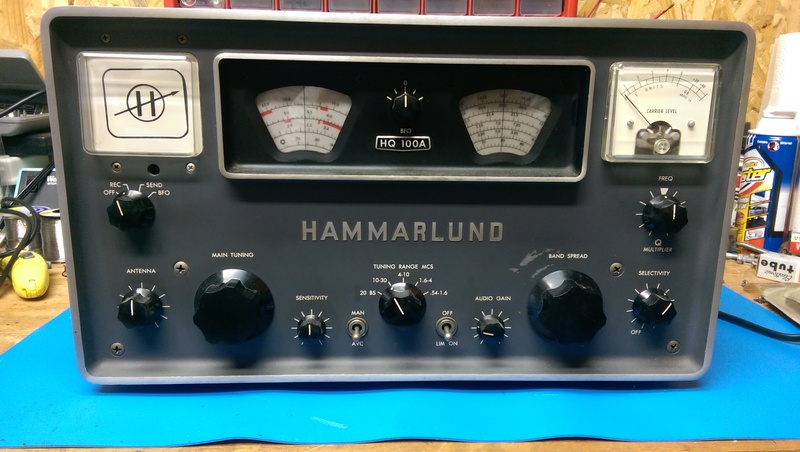 The two I’ve been working on are a Hallicrafters S-53A and Hammarlund HQ 100A. They both exhibit some audio hum and could use some refurbishing, but so far they receive pretty well on a wire antenna. The S-53A now rests on the mantle in my family room and is occasionally fired up for a little AM listening enjoyment. My most recent project is getting the shack cleaned up for winter operation. I’ve moved around a bunch of gear to improve the overall layout. Some items have been packed away for a later date and new projects are on the bench. I built a new shack computer to operate the Flex-5000 and all the software that goes along with modern radio operation. In the last couple days it’s been getting a workout on 10m due to some decent propagation to Europe. I have more ham blog goodness on the way…but that’s a teaser to keep you coming back. 73 for now. Hello n9iz, would really like to contact you and possibility gather as much information as I can on my ARD-230C. Missing parts, ant additional information, etc. Hello. I’d be happy to provide you with all the info I have gathered. I’m getting ready to leave for vacation and time is a bit tight. If you give me a week or so I’ll try to gather up all the info I have. Bob Sullivan W0YVA who owned ARD has provided me with a lot of into I used for my blog posting. He’s well know among Collins enthusiasts and vintage radio restoration now days. Hope this helps.